It is important not to overlook the emotional side of Peyronie's, as the disease does not only affect the body. Men with Peyronie's disease go through wide range of emotions. They can feel angry, sad, ashamed and afraid. They can feel loss of manhood, lack of control and be uncertain about what to do, or not to do. Peyronie's can be a blow to the self-esteem and lead to loss of sexual confidence. Some men isolate themselves, get withdrawn and even become depressed. Addressing the psychological aspect of Peyronie's is therefore as important as addressing the physical part. Men with the Peyronie's disease are at high risk of getting depressed. 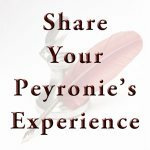 One Peyronie's Research demonstrated that 48% of Peyronie's patients had clinical depression that warranted medical evaluation. This high risk of depression should be taken seriously. It illustrates the importance of addressing the emotional side of Peyronie's as well as the physical part. Why Do Men With Peyronie's Get Depressed? It is perfectly normal to feel sad and frustrated when we face difficulties in our lives. Those feelings usually pass within reasonable time, i.e. as we “move on”. Simply put, depression is when negative feelings don't go away with time. Depression can affect people differently but feelings of hopelessness and inadequacy are common among Peyronie's sufferers. We men prefer to do things, take action, to solve problems... rather than deal with emotions and feelings. However, solving the problem, i.e. the Peyronie's disease, is usually not that straightforward. That can result in men feeling lack of control over the situation. Hence, becoming sad, down, scared, frustrated... depressed. There is no one solution fits all. There are though various things you can do to help you Coping With Peyronie's and reduce the risk of becoming depressed and isolated. Maybe the most important thing you can do is to reach out for help and support. You don't have to deal with your Peyronie's alone. In fact you shouldn't try to deal with it on your own. Communication is the best tool when dealing with depression and isolation. If you have a partner, talk to her. You may find it difficult at first but communication is the key for your relationship to survive the pressure Peyronie's is likely to put on it. If you are Coping With Peyronie's Without Partner, then consider talking to a trusted friend or family member. That is likely to seem scary prospect at first but you are likely to benefit greatly from doing so. Allowing someone that loves you to support you should not feel scary, but it sure can. It can help trying to put you in their shoes. You would want to help and support you if you were they, right? You are likely to feel amazed how much better it will make you feel, i.e. not having to deal with the Peyronie's disease on your own. You should also seek medical advice about your physical condition and, if needed, professional help to deal with the emotional side of Peyronie's, e.g. if you need treatment for depression and anxiety. There are things you can do (besides talking). Researching everything you can about the Peyronie's disease is likely to help you to feel more in control. You can take actions, like starting your Peyronie's Treatment. These are things that most men are more comfortable with, I know I am (as this is how I tackled my Peyronie's). It is still important to deal with your Peyronie's feelings as well. Don't ignore them, don't hide away from them, and don't isolate yourself, especially not from your partner. You must deal with the emotional side of Peyronie's and there are ways that can help you doing so. Living with a depressed person is not easy, so if you are feeling depressed because of Peyronie’s disease it is important that you try to do something about it. Under no circumstances, block your partner from your life. Help me to raise awareness of the Peyronie's disease among men. Send me your story and I will publish it here on this website.